Karl Kolbinger (* 1921) was principal bassoonist of the Munich Philharmonic Orchestra and in the Bavarian Radio Symphony Orchestra. As professor for bassoon at the Music College in Munich he successfully educated many generations of bassoonists. Apart from that, he was strongly active as a chamber musician and soloist, documented by numerous recordings. His compositions are mainly aimed at wind players and captivate through their thorough knowledge of the wind sound and by their virtuosic-brilliant contents. Everything can be found in them: musical, joking, rhythmical and harmonic elements take continuous turns, so that these pieces are not only suitable for the stage, but are especially a great enrichment for the pedagogical work with students. The Ensemble Fagotti Parlandi (“talking bassoons”) has made it it’s task to make chamber music understandable and experianceable to the audience by – doing their name justice – communicating with each other on the stage. 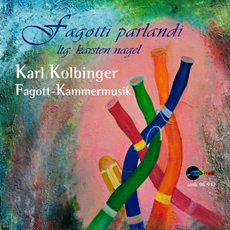 (Press reviews: “... the bassoon seems to speak – it tells a story, it rants, smirks and complains...”) The Ensemble Fagotti Parlandi presents the bassoon (known frequently only in it’s role in symphonic orchestras) as a solo, versatile and expressive chamber music instrument.